October 24, 2010 (Sacrament) At a press preview Friday for the 2010 Geothermal Energy Expo, Geothermal Energy Association (GEA) Executive Director Karl Gawell announced findings of new industry reports that show the geothermal industry will add thousands of jobs in California as dozens of new clean geothermal power plants come online or enter advanced stages of development. GEA released reports on job creation in the geothermal industry and an industry update. The reports reveal how the industry is creating more jobs than conventional energy and is creating jobs that are permanent, full-time, and often provide a higher wage--in some cases with pay that doubles county and state averages. The GEA report—“Green Jobs through Geothermal Energy”—found that the federal stimulus, tax incentives, and strong state renewable standards continue to fuel the growth in geothermal power and job creation. Every geothermal project that came online in 2009 took advantage of the tax reimbursement provisions of the stimulus bill, which helped maintain momentum for new projects and continue to create new jobs in America. Four of the top five states with geothermal power under development have substantial renewable electricity standards. In addition, the benefits of the stimulus to the geothermal industry have yet to be fully realized. About 95% of the projects receiving ARRA funding are either less than 50% complete or have yet to break ground. GEA anticipates that 2011 will be a high-point of geothermal activity in the US under the stimulus legislation. There will be approximately 500 to 700 Megawatts of power projects in the final construction phase in 2011, and these projects will add approximately 3,000 construction jobs, primarily in Nevada and California. ARRA also appears to have drawn a diverse group into the geothermal sector. Almost half of the Geothermal Technologies Program awards from the stimulus went to non-industry entities such as colleges and universities; cities, counties, and other state and local institutions; tribal entities; and The Department of Energy’s National Labs. “Ram Power is proud to be part of the burgeoning geothermal industry in the Western U.S. which owes its existence and robustness to the support of the state and federal mandates and incentives. We believe that the Imperial Valley in Southern California and the Geysers in Northern California are two world class geothermal resource areas and we are diligently working to finance and execute more than 300MW of projects, for which we have power sales agreements. Over $1B will ultimately be invested in Ram projects in California—creating drilling and construction jobs as well as high-paying, permanent plant operations jobs across the state,” said Jeremy Magrath, Project Manager, Business Development, Ram Power Inc.
"Potter Drilling is developing a revolutionary hard rock drilling technology that holds the promise to lower the cost and risk of developing geothermal power. Recovery act funding has helped Potter Drilling to create and maintain high paying green jobs and to accelerate development of our technology,” said Jared Potter, CEO, Potter Drilling Inc.
As more geothermal industry jobs are being created, a number of colleges and universities across the country are emerging with undergraduate, graduate, and certification programs related to geothermal. GEA compiled the “US Geothermal Education and Training Guide” that details 22 undergraduate and graduate programs at U.S. colleges and universities. Additionally, 31 schools have research opportunities in geothermal studies available to students. “To keep creating jobs in the geothermal industry, we must keep getting talented individuals coming into the industry. The programs at these leading schools will develop the next generation of geothermal professionals,” Gawell said. Earlier this month, the GEA Board of Directors voted unanimously to oppose Proposition 23 on California’s November 2 ballot because it would “jeopardize the state’s leadership in renewable energy and undermine growth of the industries that are the foundation of the future global clean energy economy,” a press release issued by the GEA on October 4 stated. Prop 23, which would rollback provisions of AB 32, “would undermine California’s most important initiatives to promote economic growth and foster technology leadership,” the release stated. Because of its location on the Pacific's "ring of fire" and because of tectonic plate conjunctions, California contains the largest amount of geothermal generating capacity in the United States, according to the California Energy Commission. 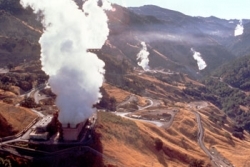 California is the largest geothermal power producer in the U.S. and geothermal energy is the sate’s largest renewable source of energy, producing 5% of California’s electric power. California has 2565.5 MW of installed geothermal capacity, enough to power 2.5 million homes, with another 35 geothermal projects in development that would amount to 1997.7 MW, enough to power an additional 2 million homes. The U.S. Department of Energy has awarded $47.4 million to 22 geothermal projects in California to develop new technology, further boosting our state’s geothermal power output, according to the GEA. The complete reports are available at http://geo-energy.org/reports.aspx. This news is awesome! Like I said in my blog, this is a win-win situation for everyone involved here: employees who will benefit from the new green jobs, the industry and of course, the environment. This is great too many people think that you can use scrubs on coal plants to get clean energy, but this is not true. We need an alternative energy plan, and we need it now! I think this article is very informative about other source of energy that we can harvest aside from fossil fuels.